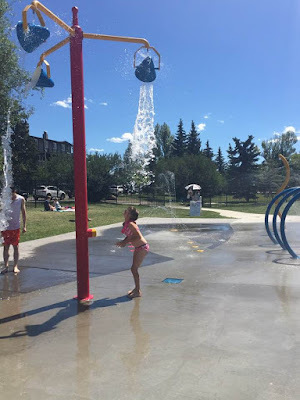 A few Sundays ago, Penelope had a soccer game in Airdrie so we decided to meet up with some friends at a splash park in the afternoon. 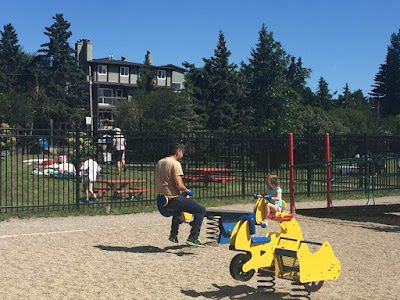 We went to Rotary Park, which is located on the hill north of Memorial Drive and east of Centre Street in the NE. 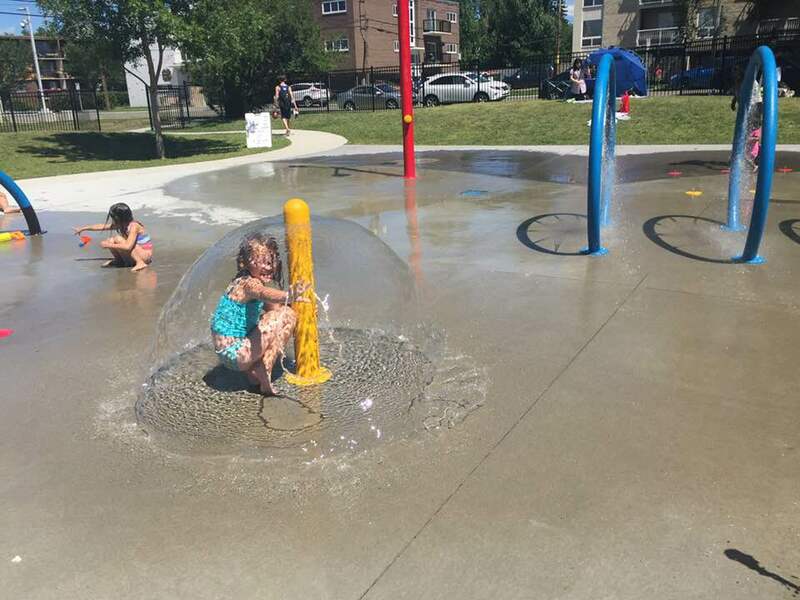 It contains an off leash area, playground and a splash park. The actual street address if you need to google map it is 617 1st Street NE. It does have a picnic area and a bathroom/change room which is a good thing to have haha. There are also tennis courts and lawn bowling near by. And on that note, if anybody wants to go lawn bowling let me know because I would love to try it! The park is open until 11pm each night but I believe the spray park turns off at 9 in July and I think 7 in August. I don`t remember how long it runs for but since it is run by the city, I am guessing it shuts down on Labor Day weekend. 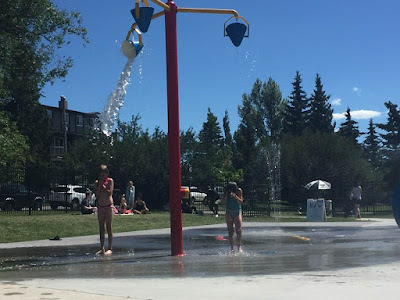 The splash park was a lot of fun for the girls. It is a pretty decent size so there was lots for them to play with. 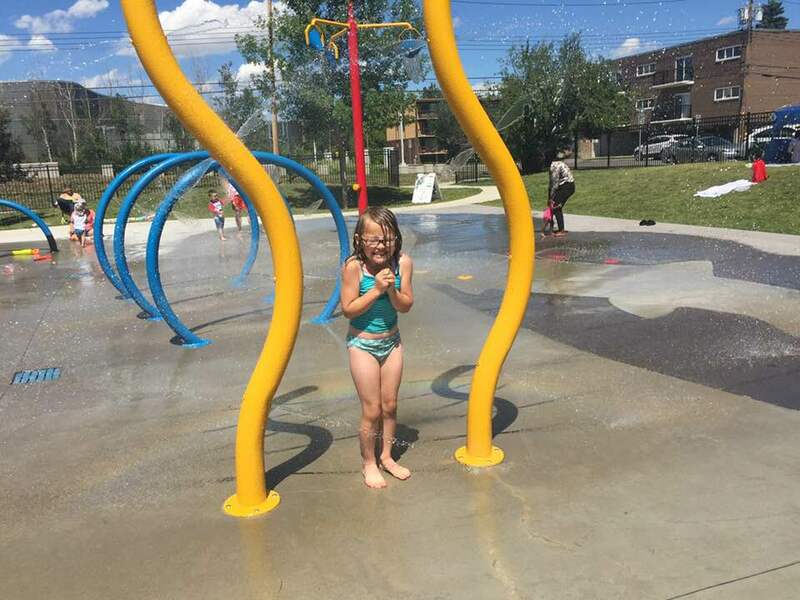 This was Finley`s favorite part of the spray park. 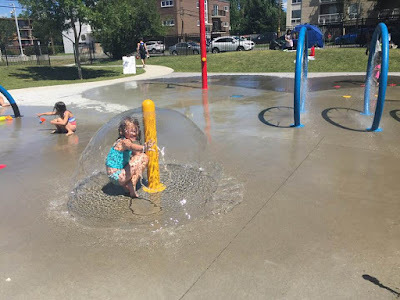 And hiding in the bubble was Penelope`s Favorite part. It kept her dry and warm and was fun haha. The water was very cold though despite it being so warm outside. The girls also devised obstable courses that they had to go through. It always ended here. The playground portion which is on the other side of the bathrooms is MASSIVE. They have 3 different sections of the playground. It was pretty incredible to see what they had. 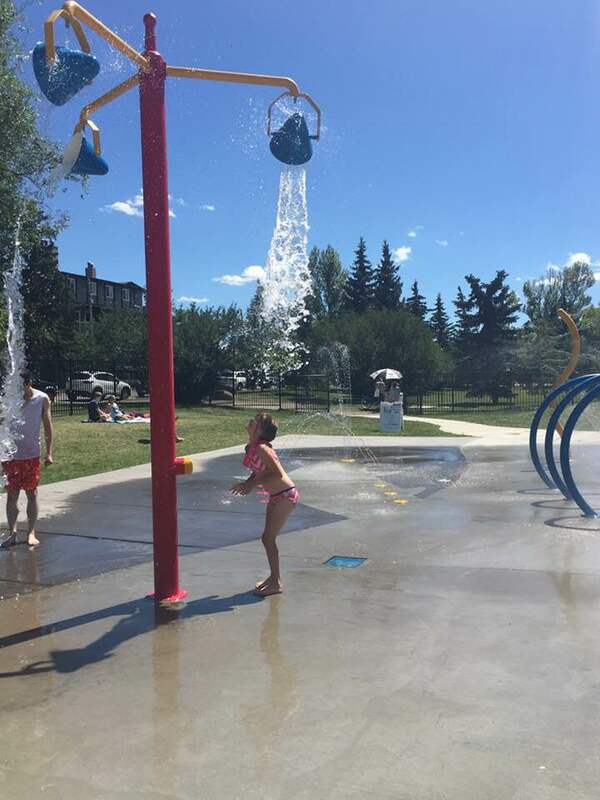 The kids (and Greg) really enjoyed it. 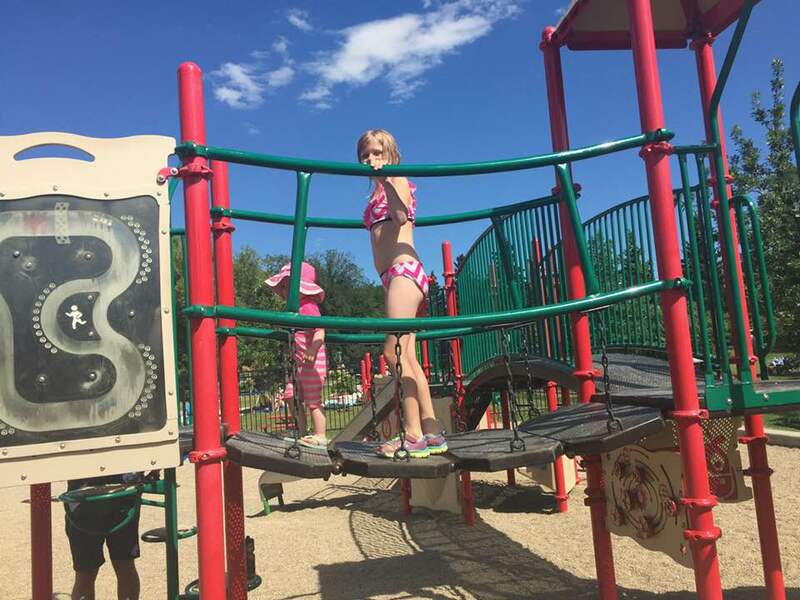 My only complaint about the playground is this. The bridge just doesn`t feel safe to me and would be so easy for a little kid to fall off or over. Perhaps I am being paranoid, but I was so stressed out when they were on here together. 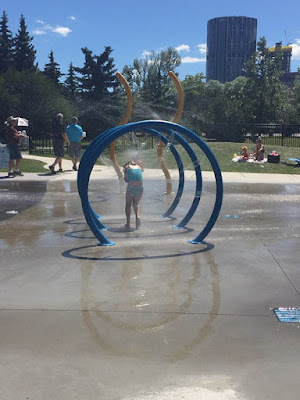 This was the first time we have been to Rotary Park and we all really enjoyed it. If it were closer to us, I would probably guarantee that we would be back again but it is pretty far from our house so that distance alone is the only reason why I would say that we might not be back. If you do live near by or don`t mind the drive, go check it out. They do have a 2 hour free parking lot. They do have street parking but not sure if it is park plus or timed free parking.